The ending of Before Sunset (Richard Linklater, 2004) presents a litmus test, a method for separating the romantics from the skeptics in the audience. Being a logical person, however, I have always thought Jesse’s satisfied smile as he answers, “I know” to Celine’s playful admonishment, “Honey, you’re gonna miss that plane” meant their remaining together—perhaps even in Paris—was a sure thing. 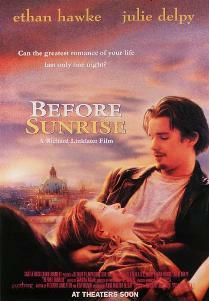 Before Sunset is one of those rare “franchise” films in that it’s actually better than the originator of the series, Before Sunrise (Linklater, 1995). The later film, edited so that Jesse and Celine’s chance reunion over the course of one afternoon unravels in approximate real-time, is wistful in tone and very adult in theme. By virtue of their having a history (and our being privy to it), it’s much more intimate than Sunrise. And who could resist the opportunity to see the idealistic twentysomethings (who, as strangers, once shared a formative romantic night together in Vienna) all grown-up and cynical, processing that rendezvous and how it has shaped their lives since. 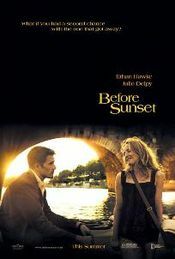 That’s why, combined with the supposed ambiguity of Before Sunset‘s conclusion, we fans have hoped that director Richard Linklater and stars Ethan Hawke and Julie Delpy would bring these vivid characters back to the big screen again. Aside from wanting to fulfill their own creative energies and desires to shoot another picture about Jesse and Celine, I would imagine that the creators also want to please the fans who can’t let the characters go. Like many others, I have followed the possibility of a third film coming to fruition, reading everything from an online interview over here to a newspaper profile over there. Recently, everyone involved has kept the details of the (pre)production close to the vest, only ever going so far as to say something to the effect of “we’re working on it, we’re working on the script.” Well, good news, friends: they’ve done us even better by finishing the shoot just yesterday! Mike Fleming of Deadline New York reports that Before Midnight wrapped production in Greece Tuesday night (I guess Hawke’s title suggestion, Before We Go Crazy, didn’t make the cut). Fleming quotes a written statement from the co-writers, which offers nothing in terms of the story or plot of the new film. In other words, it’s still unclear if Jesse and Celine have stayed together since Paris or are reconciling yet again. Hell, they may have even dated and split up in the interim. We have to wait a little bit longer to find out. But what a coup, huh? How marvelous that everyone managed to fool us all into thinking that the film hadn’t even gone into production yet. Here’s to a swift post-production and not-too-distant release date! < Previous News Clip: What Possessed People to See The Possession?